It is time to pack your chunky knitwear away because winter is finally over! With the temperatures rising and the sun shining brighter, springtime is delightful anywhere, but in Paris it is truly magical. 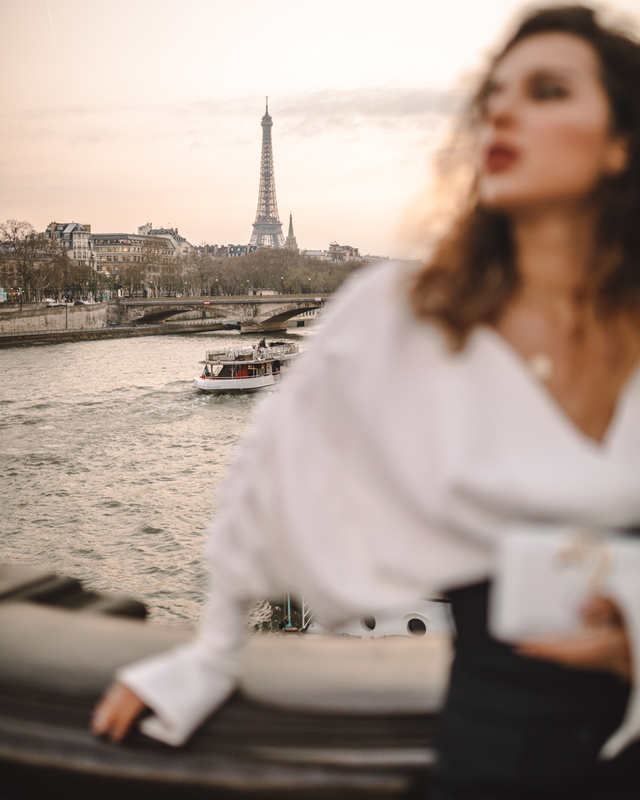 Spring is probably the best season to visit the city, so you can see trees bursting into bloom, peacefully relax with a cup of coffee in a sidewalk café or simply wander in awe all day long beholding the nature and magnificent architecture of Paris. See the best spots to enjoy spring in Paris in this article. 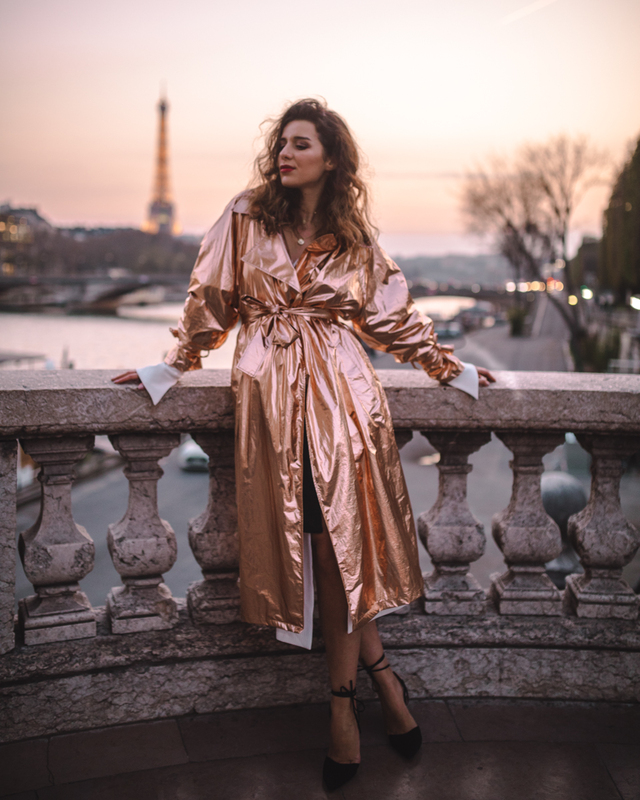 Let London, New York, and Milan compete for the title of the world fashion capital based on the number of fashion houses and catwalk shows but we all know that every baby born in Paris gets not only the French citizenship but also an innate sense of fashion, a knack for Parisian chic. It is no wonder that the whole world goes into a frenzy because of the Parisian women. Their elegance seems effortless, their charm is irresistible and their confidence is unshakable. Thus, here are some simple but nonetheless perfect outfits for Parisian spring that will let you blend in. much in vogue these days. Beneath the trench coat, you can wear either a pair of jeans or a lace dress. However, consider the length of your coat when pairing it with a dress, and remember that a coat should always be longer. Although beige is considered a basic colour of a trench coat, it comes in many variations. Petal pink is romantic shade that will be perfect for Parisian spring. While Coco Chanel insisted that every woman should have a little black dress in her wardrobe, Jean Paul Gautier seems to be planning to dress the whole nation, both men and women, in this striped cotton shirt. Also known as a Breton shirt, a marinière is an essential part of the French wardrobe. Its popularity rests on the fact that the French take pride in being one of the greatest seafaring nations. Due to the image of the Sailor popularized by Gautier, a marinière worn by men often expresses raw sexuality. A woman, however, should not feel burdened with any presumptions of such kind because of wearing this item. The thing is that since at the beginning of the 20th century a striped shirt was an element of the kid’s garment, women of all ages wearing it today are associated with youth and charming, daring playfulness. And that is just what we want from the perfect outfit for Parisian spring! A beret is a hat made from felted wool that is beloved by the knights of brush from Place du Tertre as well as by many tourists. Tourists reckon it rather a souvenir than a fashion item since berets are now sold literally on every corner. Nevertheless, do not let this fact stop you from wearing it! The ultimate problem is that not everyone can pull off a beret. First of all, it mustn’t sit tight on your head, so make sure to choose a bigger size. Then, do not forget to pull it on the side a little bit, otherwise, you’ll end up looking like a famous Parisian mime. A beret is not restricted to wearing it with coats alone; feel free to pair it with t-shirts, jackets, denim jumpsuits, etc. Although French ladies do enjoy such blessings of women’s emancipation as a pair of comfortable jeans or fashionable pantsuits, they often prefer to wear dresses. That is why you just can’t go wrong with a nice chiffon dress of midi length when packing a suitcase to spring Paris. Due to the variety of colors and patterns, it may be hard to make a choice, so pay attention to the trending floral patterns or polka dot, that is always in vogue. Celebrate your femininity wearing this sheer chiffon dress! 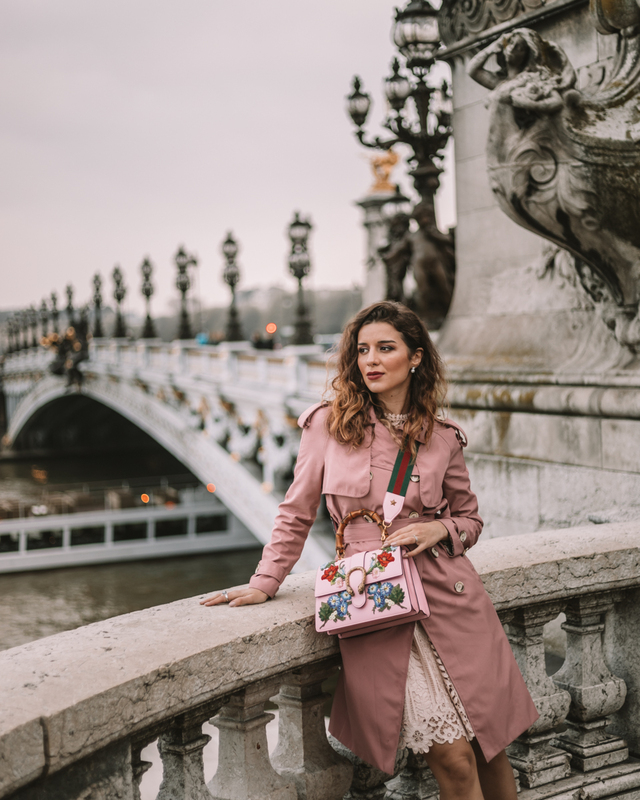 They say the devil is in the detail, and this nugget of wisdom is absolutely true when speaking about composing a perfect stylish outfit for Parisian spring. Gloves, scarves and sunglasses are the Parisian fashion pillars when it comes to accessories. Sitting either behind the wheel of her cabrio or in a sidewalk café, a Parisian woman is always enigmatic. To add an air of mystery to your look tie a silk scarf around your neck and pair it with vintage sunglasses. To dress up your outerwear get yourself a pair of chic leather gloves from Maison Fabre. Do not forget about the handbag. It may be either Louis Vuitton speedy bag or classic Chanel 2.55 as well as unique designer bags, the choice is yours. Parisian women are always extremely sure of themselves and do not hesitate to add some drama to their lips with a saturated shade of red color. Note that Parisian chic doesn’t tolerate too much jewelry that’s why you would never see a Parisian woman wearing all her rings at once or pairing earrings with a necklace.